It has been a while since my last steamboat dinner, hence when I heard that Madam Wong's Steamboat had a grand launch for their second branchover at Dataran C180 Balakong, I snapped at the opportunity to attend and try out their steamboat. Their first branch is located in Cheras just behind Leisure Mall. 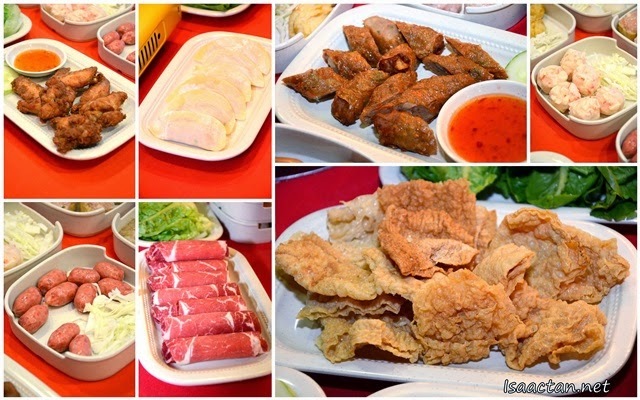 Located in the Balakong C180 area, Madam Wong's Steamboat is located along a stretch of other steamboat restaurant. 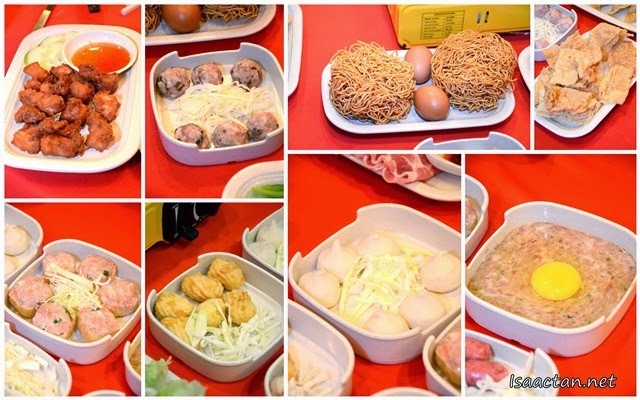 Sandwiched between two other steamboat restaurants, it was indeed a lively sight, as the restaurant was fully packed with guests and diners in conjunction with their grand launch. The owner's goal for this year is to open up 10 branches in Malaysia, with Penang, Johor Bahru, Singapore, and even Hong Kong in the plans. Notable celebrities, radio DJ Jeff Chen, and TV host Gary were in attendance for the ribbon cutting ceremony, livening up the already 'hot' and fun atmosphere. There were lion dances as well. The restaurant is open daily, from 4pm to 12.30 am with affordable soup pots at RM17.80 and half pots at only RM8. We ordered the full hot pot with a combination of Madam Wong's signature Beef Bone Soup and Pork Bone Soup. This time around, we skipped the spicier soups for a more healthier option. Part of our meal for the night, the first wave. It was a feast, with multiple waves of meat, fishballs, meatballs, and vegetables being served to our table. I particularly liked the 'shabu shabu' styled Slim Beef Slices, Pork and Lamb Slices which went really well with the accompanied sauce and tasty soup. At RM9.90 per plate, the generous servings of meat slices were more than enough to fill one's stomach. I must say, it was indeed a satisfying meal at Madam Wong's Steamboat, with a crazy amount of dish choices to choose from. The soup base was good as well, giving out an aromatic smell and great taste. Each of the dishes served ranged in price from RM5.90 onwards with the scallop and fresh prawns going for RM8.90 and RM18 respectively. They even had these ready to eat appetizers like the Fried Chicken Wings, Curry Chicken, and Fried Prawn Cake which went well with my taste buds. If you have not tried them out yet, do check out Madam Wong's Steamboat @ Dataran C180 Balakong should you suddenly have the mood for some piping hot steamboat on a cold night. Best to go with friends, as it is always nice to share the happiness. They currently have an on-going promotion where customers who spend over RM100 or more will receive a Chocolate Fondue duck dessert valued at RM18.90. Oooooo...so many people. I love steamboat. Take me there when I go over, ok? where is this dataran Balakong ya? Near Aeon ka? The other 2 steambot taste better.